Woodstock Pizza - San Diego Dining Dish! 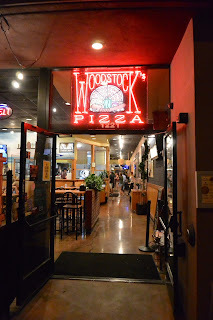 Woodstock Pizza is one of the many great places offering fresh pizza with great beer in San Diego. What sets them apart from some of the other places? A refreshing atmosphere that appeals to both college students and families, and pizzas that knock it out of the park. The menu is simple: pizzas, salads, and typical pizza shop appetizers. Most people expect some customization options for their pizza, but Woodstock goes the extra mile and allows customers to choose the crust, sauce, and fresh toppings! The menu is a bit overwhelming with all of the choices, but there are some combination pizzas on the menu mix the ingredients in the tastiest way possible. The crust can be either white or whole wheat, and the sauces can be any of the following: zesty red sauce, pesto, creamy garlic, BBQ, Southern chipotle, and creamy sriracha. We started our meal with the Greek salad, a pizza shop classic that is classic for good reason. It's delicious! This Greek was enough for two to share as an appetizer, and packed with fresh tomatoes, kalamata olives, cucumber, and feta cheese. The salad was so flavorful, it hardly needed dressing, but the balsamic vinaigrette was wonderful! For our pizza, we chose to have a double whammy of half pesto primavera, and half of the Boardwalk combination, with the white crust. The pesto primavera was loaded with fresh tomatoes and broccoli, with a nice coating of the pesto pizza sauce. The real star of this pizza, however, is the artichokes. Briny and chopped into manageable pieces, the artichokes were what really gave this pizza its flavor. I know that pizza is hardly a health food, but this pizza definitely had lots of merit with the broccoli and fresh tomatoes. The Boardwalk pizza featured a more classic topping choice of fresh red and green peppers, sausage, mushrooms, and pepperoni. However, the red sauce made this pizza out of the ordinary. The fresh toppings really made this pizza. With the sausage AND pepperoni, you would think that this pizza would be greasy, but it wasn't at all. Again, fresh ingredients make all the difference. Our bellies were pretty full at this point, but we did manage to get a taste of the Cinnabread dessert pizza. It's a mini pizza topped with cinnamon, sugar, and frosting, much like a cinnamon roll. It's a nice sweet to end the meal, and would be great leftovers for breakfast as well. Woodstock has locations in both Pacific Beach and the College Area near SDSU. It's a great place for families, and offers take out and dine-in options. Definitely worth a visit!